This is a late post but picture collage is from the UNISON Parliamentary reception on 28 April 2016 for about 50 Labour Link members in North East London. The Greater London UNISON Political Officer, Steve Terry introduced the Speakers. The first speaker was Ilford North MP, Wes Streeting MP, who spoke about being a new MP and the importance of people participating in the political process. He then had to dash off since he was leading a tour of the House of Commons for his constituents. Next was Stella Creasy MP who talked about her experiences involving her constituents in campaigning on local and national issues such as the eviction of tenants whose homes had been sold to developers and helping to get interest rates on "payday" loans restricted. 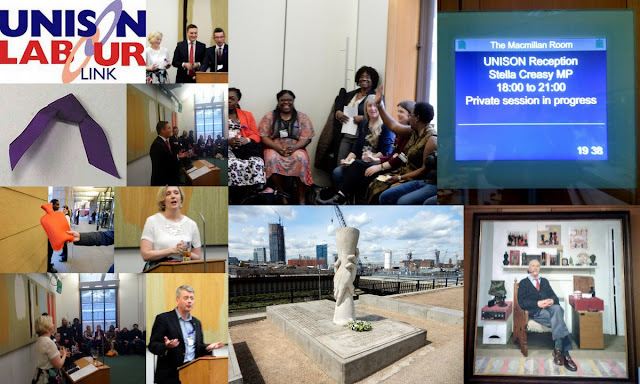 I spoke as Chair of Greater London Labour Link about this day being Workers Memorial Day and the 50,000 people who die prematurely each year from work related ill health. It is a day not only to mourn the dead but to fight like hell for the living. Afterwards Stella and her Parliamentary assistants organised tours around Westminster. Many of the UNISON members present had never been to Parliament before. (picture in bottom right of collage is the painting of Tony Benn which was outside the meeting room).